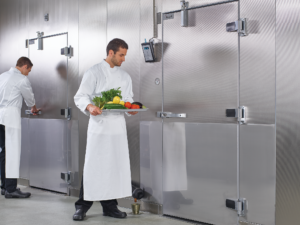 In an ever-changing world it is inevitable that refrigeration requirements will change as well. The EPA has mandated to remove R404A as a viable refrigerant for remote walk-in refrigeration systems. Kolpak is taking the lead on this mandate by not only meeting the 2018 standards, but meeting the 2020 standards. Kolpak is choosing to go with R448A as their new refrigerant. With a new refrigerant comes a new refrigeration system. The main thing most people will notice is the compressor. Kolpak has chosen to exclusively use scroll compressors. Scroll compressors are more expensive but worth the investment. The efficiency and reliability far outweigh the hermetic and semi-hermetic style compressors. Also, the horsepower of the compressors are larger to meet the demands of the new refrigerant. This will change electrical loads so be sure to keep that in mind when designing your system. Kolpak will begin shipping R448A systems December 1, 2017. All R404A systems must be commissioned be 12-31-17 or it will not pass the new compliance requirements. Be on the lookout for these new systems soon. If you have any questions, please reach out to our Brand Champion, Russ Griffis and he can walk you through all the new changes.